19 million Americans are labelled as hoarders. That’s a significant number of people who need help getting organized! Hoarding can negatively affect your finances, which is never a good thing. Today we’ll discuss how to take control of hoarding tendencies and stop the cycle. So how does an innocent collection of items turn out to be financially destructive? Lose bills amidst the clutter – bills unpaid equals penalty fees. Misplace cheques and even cash. Buy things you don’t need. Spend money on non-piority items. Collect multiple items because if you can’t find what you’re looking for you purchase another one. Rent a storage unit for extra space. These habits can create a financial problem in the long run. Hoarding, even just a little bit, can leave bank accounts empty while homes are filled with unnecessary belongings. Things go from woe to worse when you start acquiring things beyond your earning capacity and fall into credit card debt. This may cause financial stress and in turn creates a bigger burden in your everyday life. Stop you from buying the same thing twice. Save you space therefore no need to buy storage containers or rent units. Help you avoid penalty fines for late bill payments. Actually make you money if you are able to sell your excess items. Lessen stress and anxiety in your life so you can prioritise what matters. Stop impulse buying because you know exactly what you have at home. Remember that lots of accumulated stuff may carry a big price tag. Start the change now. Hoarding tendencies can come in many forms. If you think you have excessive hoarding problems then we encourage you to seek professional help. Want Help To Simplify Your Life? Then our next online program is perfect for you. Join our 21 Day Simplify Your Life Challenge. A version of this article was originally posted on Get Organized Wizard in 2017. 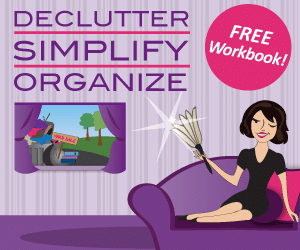 This entry was posted in Fresh Start, Home Organization, Life Management and tagged decluttering, hoarding, save money.